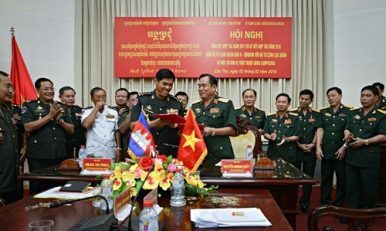 Last week, a high-ranking Vietnamese defense delegation paid a visit to Cambodia. Though the engagement was just one of several between the two sides, it nonetheless highlighted some of the ongoing activity in the defense side of the relationship between both countries within the context of their respective domestic and foreign policies. As I have noted before, Vietnam and Cambodia share a defense relationship which both sides tend to characterize as being a pillar in their wider diplomatic ties. Bilateral defense ties extend across several aspects, from Vietnam’s provision of the Royal Cambodian Armed Forces (RCAF) with equipment, training and aid to the joint management of more sensitive areas of the relationship such as outstanding issues over their shared 700-mile long border. Over the past few weeks, the defense relationship has been in the headlines again with the visit of a high-ranking defense delegation to Cambodia. The delegation, led by Vietnam’s Defense Minister Ngo Xuan Lich, paid an official visit to Cambodia that lasted from December 27 and 29 at the invitation of his counterpart, Tea Banh, who also holds the deputy prime minister position as well. The visit had a mix of symbolic and more substantive interactions. Lich met with a range of Cambodian officials, including his counterpart as well as Prime Minister Hun Sen, and also paid a visit to the Vietnamese embassy in Cambodia. He and the Vietnamese delegation were also involved in other ceremonial activities as well, including the laying of wreaths at the Vietnam-Cambodia Friendship Monument. As is customary with meetings that involve the two defense ministers, the two sides evaluated the state of their bilateral defense relations and the opportunities and challenges therein. They also discussed areas for further collaboration into 2019, with the two defense ministers inking an agreement on some of the key items for defense cooperation in the new year. According to Vietnam’s defense ministry, during Lich’s meeting with Hun Sen, they discussed some areas where defense cooperation may be advanced in the future, including information dissemination and education for troops, personnel training and delegation exchanges, joint border management and exchanges, and search and repatriation of remains for Vietnamese soldiers in Cambodia during years of war. Unsurprisingly, few additional details were publicly released about what specific activities both sides will be eyeing for 2019, which usually involves a mix of general continuity and some incremental change in key areas. As the year progresses with its mix of planned activities and ongoing developments, we can expect that the emerging shape of Vietnam-Cambodia defense collaboration will become clearer. What’s Next for Vietnam-Cambodia Military Ties in 2018?